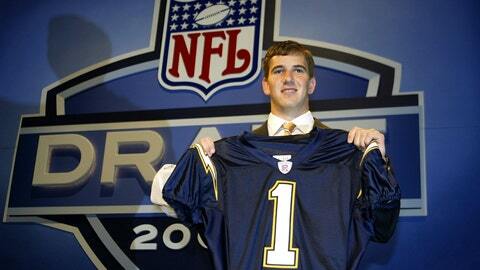 Eli Manning was drafted No. 1 overall by the Chargers in 2004, then traded to the Giants on draft night. Eli Manning’s memory already is starting to go at the ripe, old age of 32. Almost a decade ago, Manning and his family made it crystal clear that he had no interest in playing quarterback for the Chargers in the days leading up to the 2004 draft. San Diego snagged him anyway, selecting him first overall, and after one incredibly uncomfortable photograph, the quarterback’s time as a Charger was over as he was traded to the Giants. The awkwardness was short-lived, with Manning being shipped to New York before he was even able to put on his San Diego hat, but as Manning prepares to face the man for whom he was traded, Philip Rivers, on Sunday, he can’t explain why he was so against playing for the Chargers. "I forgot, I think," Manning said via the Newark Star-Ledger. "I just can’t remember, it’s been 10 years. It slipped my mind." Manning wasn’t able to recollect his strong opposition to joining San Diego, but he was able to provide a perfectly good explanation as to why he wouldn’t don the cap. "Did I put the hat on? No? I didn’t put the hat on?" Manning asked. "I just, my hair was feeling good that day. I didn’t want to mess it up." Manning certainly had something against the team that calls San Diego home, but said he has nothing but kind words for the city itself. "I have nothing against San Diego as a city," Manning said. "We had our rookie symposium there and besides that, we’ve had a few other things; I know it’s a beautiful city and great weather. There’s a lot of great things to it."